Slowly bring the sugar and water to boil in the saucepan. Allow this to simmer for 2 minutes to make a syrup. It will thicken slightly, leave to cool. Strain the fruit juices and mix them together in the jug. Purée the mango using a liquidiser or mash the flesh with a fork and press it through a sieve. 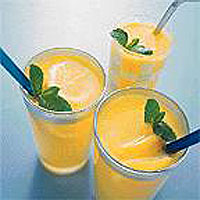 Stir the mango with the fruit juice and chill in the refrigerator. When the syrup is cold add it to the fruit juice mixture and chill in the refrigerator. When ready to serve, stir the ginger beer or soda water into the fruit juice mixture. Serve the drink in long glasses with the lemon or lime slices and mint leaves. Take care with the syrup which will be very hot. Try using different fruits - the juice of other citrus fruits (clementines, limes, passion fruit) or the flesh of soft fruits (strawberries, raspberries, blueberries). Sharp knife, chopping board, juicer, large jug, saucepan, tablespoons, teaspoon, wooden spoon, sieve and liquidiser.